It started suddenly! After lunch, we were supposed to head for Golden Pavillion as the second leg of our tour. 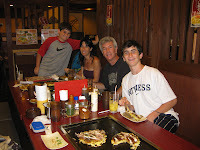 When we got out of the Okonomiyaki restaurant, it started raining. At first I thought it would slightly rain, but against my prospect, it started pouring. However, the rain was getting harder and harder. At that time, suddenly, a woman of our group took her shoes off. It was surprising to me. That was because she hate to have her shoes gotten wet. Anyway we,including a woman with no shoes on, looked around inside the Palace. It was the first time to see all the wooden shutter of the palace closed. It was a shame that it was too dark inside to recognize the design of wood carving above the sliding doors. Happily, it stopped raining while we are visiting the castle, so we went to Golden Pavillion. However, unluckily, we failed to visit Ryoanji rock garden due to delay of the bus we were going to take. Instead we headed for Arashiyama to see Bamboo forest. To go to Arashiyama, we used Randen line. It is a very small train consisting of only one coach. When she saw the train coming, she said " How cute!" It seemed to be beyond her expectation. 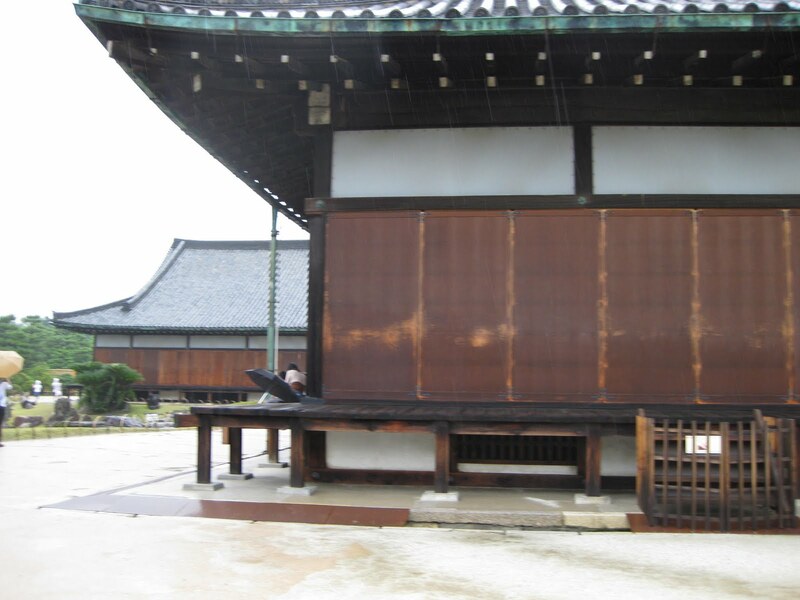 The next day, our member, Saki showed them around in Nara and Fushimi. Yasaka shrine, Nishiki Food market, Nijo castle, Golden Pavillion, Bamboo forest. Kasuga shrine, Todaiji temple, Fushimi Inari shrine.